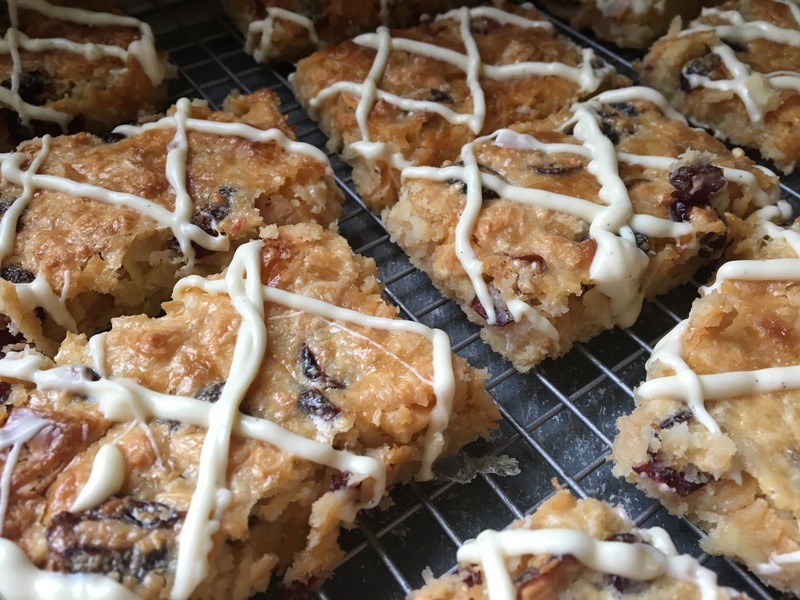 Cranberry, White Chocolate and Coconut Magic Bars. I’d had a manic few days at work so to come into the kitchen and bake was a great tonic for me. I feel guilty every time I bake at the moment though. I shouldn’t be doing it as eating the sugary stuff is not good for my health. But at the same time I love the process of making it. Why does baking always feel so much more exciting to me than cooking a casserole or a roast dinner? It was a cold, damp and foggy Thursday morning last week and I was very tired. I’d taken my son to the bus stop three miles away and gone out and walked the dog. My warm, cosy and inviting kitchen beckoned. As I was walking across the muddy field with my dog, all I could think about was getting back home and into my kitchen. I was thinking about some ingredients I had in the cupboard left over from Christmas. These included two bars of white chocolate and some dried cranberries. It was a miracle that the chocolate hadn’t been nicked by the kids but then one of them is away at uni! My son has been trying to eat sensibly too. Looking through one of my favourite cookbooks The Hummingbird Bakery Cake Days, I found the perfect recipe on page 49 for Cranberry Magic Bars. There wasn’t a picture to accompany the recipe so I had to guess what they might look like. From looking at the ingredient list it said what I needed for the base and for the topping. So that meant it was baked in two parts. Nothing explaining it in the recipe introduction either. I had to go on my own instincts here and worked out that the bars were made up of a shortbread type base and topped with a condensed milk, chocolate, dessicated coconut and dried fruit concoction. Sounded scrumptious to me. Luckily I had a tin of condensed milk in my baking stash from Christmas. Bought with the intent of using it to make fudge with, it never got used. I also needed white chocolate, cranberries and pecans. I didn’t have any pecans. The only nuts I had left was some flaked almonds so I put those in the recipe instead of the pecans. I lined and greased my well loved Alan Silverwood Traybake pan and then put the made up base into the bottom of it. This was quite a challenge. The base had to be extremely thin and I ended up pressing it down with the back of a spoon to make it even. It only just covered the bottom of the tin. Into the oven it went at 150oC (fan oven) for about 15-20 minutes. I wanted the base to be a gentle golden brown. While the base was being baked I made the topping. This was simple enough. The condensed milk, white chocolate, cranberries, desiccated coconut and the nuts were mixed together. I used a whole 100g bar of white chocolate chopped up instead of a bag of white chocolate chips. I had two bars but I thought I’d save the other one for another time. The mixture was spread onto the base and back into the oven it went for about 20 minutes. Being as I wasn’t sure what the bars were meant to look like, it was confusing. When they came out of the oven they looked a bit boring. So, to make them more enticing to eat I melted my other bar of white chocolate and piped on a lattice pattern onto the cooled bars. They smelled absolutely gorgeous and I was tempted to grab at one and eat it there and then. I will definitely be making these again. I usually have a stall at my village’s Open Gardens event every May selling my cookies and cupcakes so these might end up on the stall. You never know! Next Post Black Cherry Cupcakes.